Last Saturday, I made a coffee cake. It was a perfectly good coffee cake, but it was a biggie, and by the middle of the week, it started getting a little stale. Plus, I was a little tired of it. So, one morning as I was contemplating another breakfast of nuking a piece, I had an idea. In the 19th century, Victorians developed a dish called milk toast – toasted bread covered with hot milk, with sugar or butter added. It was considered to be good for children or the ill – easy to digest, hot and nourishing, all that good stuff. It’s not a very fashionable food, but it’s very much a comfort food. I remember my mom saying that she likes it once in a while when she’s not feeling well. 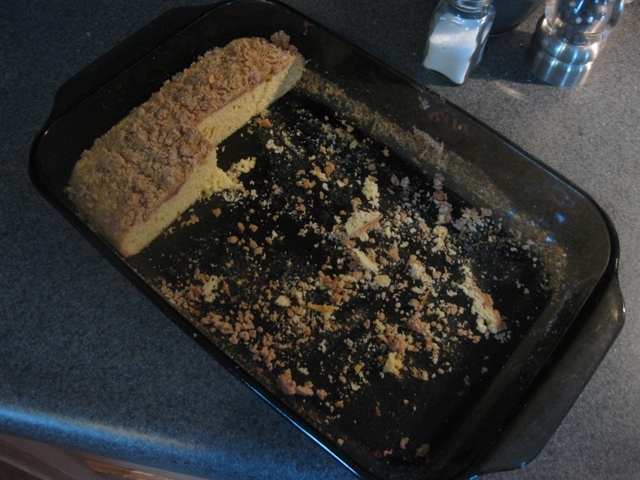 First, the remains of my coffee cake. It’s got a nice cinnamon crumb topping. 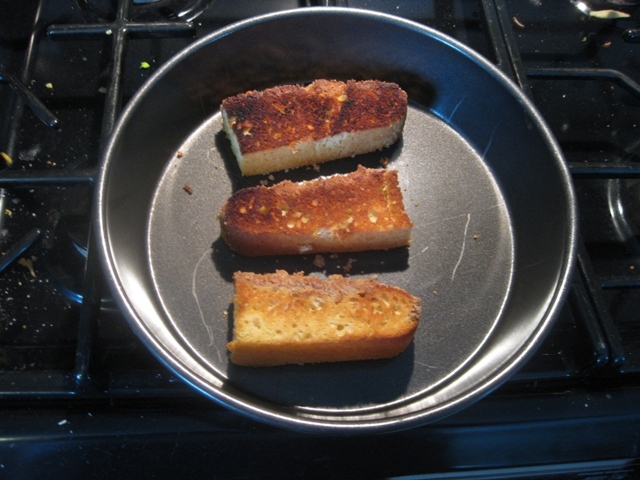 I cut three slices and toasted them under the broiler until they were golden brown and delicious. 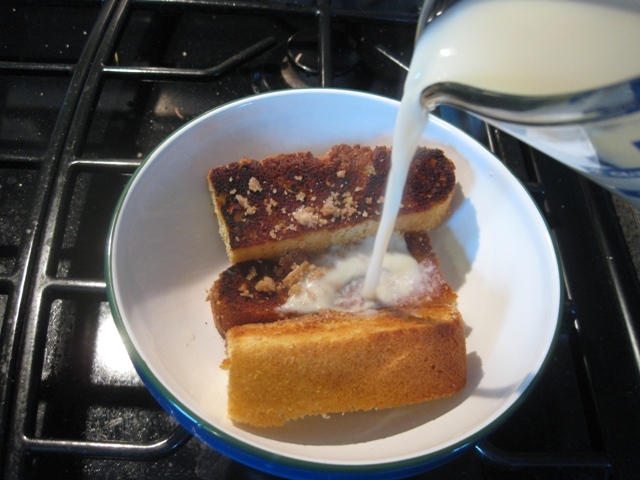 Toasting gives the cake a bit of structure and helps it hold up while being soaked in the hot milk. Confession time: I made this dish THREE times for breakfast this week, it was so good! The first time, I buttered the slices before broiling. Not a great idea – the slices didn’t brown well. The second time, I buttered after broiling. Tasty, but it didn’t really seem necessary. The THIRD time, I used no butter at all, and didn’t notice a difference in taste. 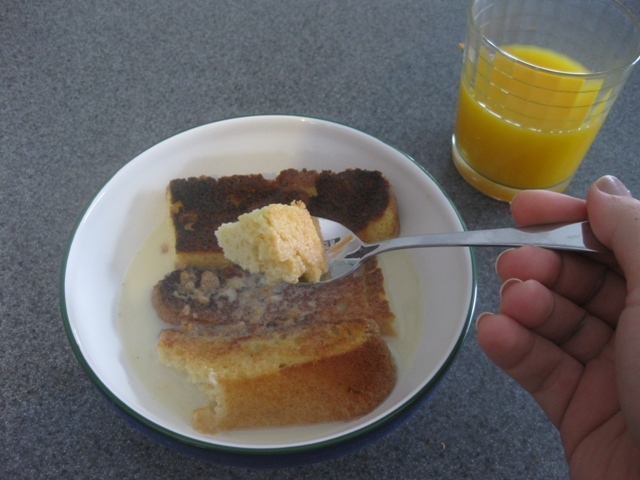 While the coffee cake was toasting, I heated one cup of vanilla soy milk in the microwave until it was steamy. You can use regular milk, too; I just like soy milk. Then, put the slices in a bowl, and pour the milk over them. Grab a spoon and enjoy while it’s hot! Great idea -I went googling for a recipe/idea for leftover coffee cake and you hit the nail on the head! Thanks for sharing it! Great idea!! I was just wondering what to do with my leftover sour cream coffee cake and this is perfect!